"We thought you was a toad!" "Damn! We're in tight spot!" Also - the soundtrack has gone onto every mobile media device I have owned since this movie came out - top-notch. I think of this movie pretty much every time I put product in my hair. The title comes from the "serious" movie that the great comedy director (played by Joel McCrea) wanted to make in Sullivan's Travels. There's nothing in this life I want more than my own tin of Fop. Mrs. Example and I still respond to John Turturro appearances with "DO NOT...SEEK...THE TREASURE!". I saw this for the first time at my parents' house, after a long drive, and dozed off about ten minutes in. I enjoyed what little I'd seen so much that the next day, on my way home, I bought it and watched it as soon as I arrived. That was a great decision, and this is a great film with a great script, great cast, great production, great soundtrack, just great. This movie is so simple and yet so brilliant. I love how it mirrors The Odyssey in much the same way Strange Brew "mirrors" Hamlet. I spent part of an afternoon once watching this film and noting the name of every town mentioned and plotting them on a map to see if I could make sense of their journey, but unfortunately they must have been chosen more for sound than cartographic continuity. I can say, however, that I did not have to look up the location of one city, what with it being my hometown. I think it's the only time it's ever been mentioned in cinema history. "Judge Hobby over in Cookeville was hit by a train." I loooooove this movie. It is bona fide! And the soundtrack is fantastic. When my kids were little, I used to play "Down to the River to Pray" and talk to them about the way the song was constructed. One voice, two voices, three voices, etc., and talk to them about the harmonies. It's a beautiful song. So is "I'll Fly Away" which I remember from childhood. Hilarious. It just takes off from there. "Them syreens did this to Pete. They loved him up and turned him into a horny toad." "You two are just dumber than a bag of hammers." "R U N N O F T"
"Oh, George... not the livestock." "They... left... his... heart! " "I'm a Dapper Dan man!" "The two of us was fixin' to fornicate!" "Can't I count on you people?!" In the early days of cinema, color grading (that is, the adjusting of a film's relative color levels) was accomplished through film emulsion alchemy. By the time CRT displays became widespread, movie makers had begun relying on telecine devices to adjust and edit the color levels on a roll of film stock. White light shown through the film negative strikes a prism, which separates the light into its component red, green, and blue lights,which then strike a charge-coupled device. This CCD converts the incoming light levels into electrical signals that are used by the telecine device to modulate a video signal that can be color-graded before being transcribed back to film. However, in the mid-1980s, digital color grading systems began to appear. Rather than converting an analog medium (film) to another analog medium (the telecine output)—adjusting the colors, then converting back to the original analog medium—these devices instead leveraged a digital intermediary for the editing and adjusting work. But it wasn't until the production of O Brother that an entire film employed this grading method and actually was output to a digital master copy. 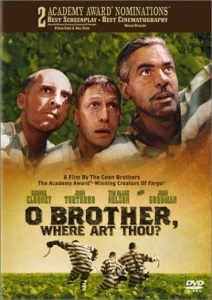 IndieWire: The Coen Brothers and George Clooney Uncover the Magic of ‘O Brother, Where Art Thou?’ at 15th Anniversary Reunion. “By the craft services, table there would be a bunch of black guys with Klan hoods in their hands!” said George, who erupted into laughter and sent the audience home on a high note. This movie has magic powers. When it was in the theaters still, I'd seen it once already, and was having a really crap day one day and spontaneously asked a friend if they wanted to see it again with me later that night; he said sure. And less than an hour later - even just the knowledge that at the end of the day, I was going to be watching it again, was enough to cheer me up and break me out of my funk. And the SOUNDTRACK. Chris Thomas King's solo arrangement of Hard Time Killing Floor Blues gets a little lost in the film, so it wasn't until listening to the soundtrack that I finally heard it properly and was floored; just him and the guitar. YAY! frimble fixed the movie poster bug! "I guess I'm the only one that remains unaffiliated!" Yeah, the soundtrack for this is great, I used to have it on CD. Such a great film. "Pa always said, 'never trust a Hogwallop.'" "I'm voting for yours truly." Love this movie; I think I saw it three times in the theater, and the soundtrack is wonderful. I need to show it to my kid - she's old enough to appreciate the absurdities and enjoy the references to the Odyssey. It's a totally perfect movie. The only complaint I have about this movie is the straight line you can draw from the its pioneering digital color correcting to the continual plague of awful blue and orange color corrected movies since. John Goodman's grifter Cyclops. So good. Ulysses Everett McGill: I am the only daddy you got! I'm the damn paterfamilias! Wharvey Gal: But you ain't bona fide! I love this movie. I'd rank it up with Raising Arizona as a Coen Bros. film that's simultaneously one of the goofiest of comedies and yet possessed at the same time of a weird, proud beauty that's not quite like anything else on the screen. Yes, this is a perfect movie. I love it particularly because it was shot around the town I'm from, something that rarely happens. Most movies set in Mississippi are there for the cruelty and sorrow, not the natural beauty, but this film really captures the landscape of the Delta in a rare way. My dad knew a few guys who were extras -- one of the musicians on the truckbed, IIRC. The shooting was a nine days' wonder in the town. My partner and I call each other Everett all the time when we want each other to look at something. "'Course it's Pete. Look at 'im, Everett." One of my favorite things about this movie is that there's a sizeable "Goofs" section of its IMDB page, meaning that there at at least that many people who were trying to view this film as a historical document. A third of a gopher would only arouse my appetite without beddin’ her back down. This film is also a landmark in that it is the first film to be entirely digitally color-corrected in post. While it was certainly done with good reason and tastefully, it is also somewhat responsible for the ugly orange-and-teal palate we see in contemporary films. Watching on Hulu thanks to this thread. It is indeed perfect. I forgot about the "K K K" mask on the horse. It's kind of bitterly ironic to watch the scene where a crowd shouts down a politician for being a racist. In Mississippi. In the 30's. at least that many people who were trying to view this film as a historical document. Awful piece of crap movie. I saw those welded rail joints (in the damn 1930s??!? )and I marched right out and got my money back! Well, ain't this place a geographical oddity. Two weeks from everywhere! You might not have known, but this was, surprisingly, the first movie to be completely digitally color-graded. It looks wonderful here, but unfortunately served as the first step toward today’s sea of teal and orange Hollywood blockbusters. I seem to remember the DVD version I had having some sort of warning at the beginning that the color was intentionally wrong. The orange and blue color palette (for night scenes) was around long before digital color grading and is probably going to be around for a long time after. For the most part it's captured in-camera on the day it's filmed. I think it mostly stems from the fact that you've got two kinds of lights on a film set: daylight (and bulbs meant to mimic that), which tends toward the blue end of the spectrum; and tungsten lights, which tend toward the orange end of the spectrum. When they were shooting on film, you'd also have two kinds of film stock, daylight film or tungsten film and you'd choose the light to match the film and vice versa. The combination of those lights and the sensitivity of the film meant you could easily get some striking high contrast lighting effects where the dominant colors would be blue and orange and this was especially useful for night time scenes. It ends up being kind of hack-y though, because everybody learns how to do that in film school, and it really is easy to achieve. I personally put more blame on James Cameron and Michael Mann for the overuse of the cool blues in night time scenes. It's been a while since I've been anywhere near a film set though, so take this rough explanation with a grain or two of salt. You probably don't know this, but this was the first film to be digitally color corrected. And it's directly responsible for the sea of orange and teal that has taken over Hollywood. I just thought someone should make that clear. I have to add my voice to those calling this a perfect film. It really, really is. I don't see how you can say that about a movie that tries to pass off welded rail joints a good thirty years before they existed. In short, Hollywood is no friend to the discerning trainspotter.